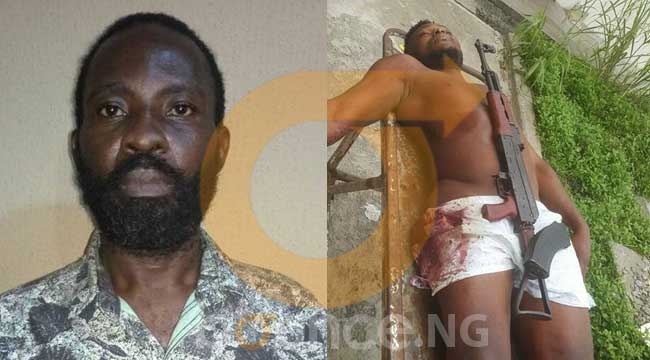 Police announce death of Port Harcourt kidnap and sea piracy kingpin and militant general, Prosper David, and recovery of ak47 rifle. Men of the IGP-Intelligence Response Team (IRT) have been on the trail of Prosper David for a long time. He was a militant general who had embraced the federal government amnesty program but returned to crime by forming a kidnapping gang with several kidnappings linked to him. His cup was full after he masterminded the kidnap of Mrs Tina Bob-Manuel in November 2017 in her shop located at No.107 Nvuigwe Road Woji Port-Harcourt. Suspect went underground after the collection of ransom in two installments and when he sensed that the Police were closing in on him, he dropped his contact number known to his personal driver that was earlier arrested by the Police. He also relocated his family from Victory Estate Azikoro Yenagoa in December 2017 to the creek, all in a bid to avoid arrest. After about 90days of painstaking intelligence gathering, the suspect was traced to Asiri area of Yenagoa Bayelsa state to his new rented apartment. On sighting the operatives, he ran into his apartment ceiling from where he engaged the operatives in a gun duel but was fatally injured and died. 1) Johnson Denis, driver to the kidnap kingpin and the militant general. Exhibit Recovered from him is one of the victims’ phone. 2) Prosper David (Deceased) kidnap and Sea Piracy Kingpin and "Militant General". Exhibit recovered from him include: One AK47 riffle, one magazine, 26 rounds of live ammunition, 4 expended ammunition and a Nokia phone belonging to his kidnap victim with which ransom negotiation was done. 3) Benjamin Johnson and Anthony Joshua are two more gang members of the Port Harcourt kidnap kingpin were also arrested between 21/2/18 and 14/3/18. Police say serious efforts are in top gear to arrest other gang members and recover more arms.